Sheri Miller, CWA of North Carolina Director, and CWA of North Carolina Associate Director, Mary Frances Forrester, have been speaking around the state to inspire and educate audiences on how to protect traditional family values with prayer, action, and votes, thus making a difference in North Carolina. Let us know if you need a speaker for an upcoming event. 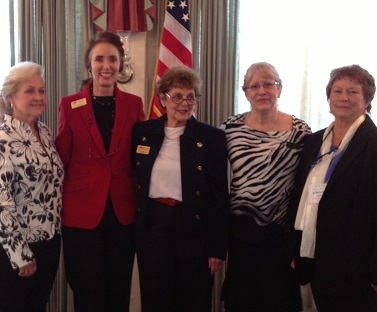 Tuesday, September 24 – Mary Frances Forrester spoke to the East Lincoln Rep Women’s Club in Denver on Sharia law and HB 522/now 695 and distributed CWA brochures. Tuesday, August 20 – Mary Frances Forrester spoke at Gem Country Republican Woman’s Club in Franklin to approximately 40 present, on Sharia Law and HB 522, and distributed CWA Sharia brochures. Wednesday, June 5 – CWA of North Carolina’s Day at the Capital in Raleigh with a Legislative Briefing was a great success! Click here to read all about it, view pictures and even pick and choose some of the speakers to listen to. Mary Frances Forrester, CWA of North Carolina, Associate Director, spoke on Sharia Law sharing how this religious law evolves to become influential around the world and specifically what is happening in the United States. Mary Frances articulates the strategic plan of radical Muslims to immigrate, become entrenched with authority, respect, and power in every part of American life. Sheri Miller, CWA of North Carolina State Director, spoke on the “Battle for America’s Soul.” CWA of North Carolina Associate Director, Mary Frances Forrester, spoke on “The Bills We are Watching,” to educate the audience on American Laws for American Courts, protecting North Carolina’s constitution from foreign laws and Sharia law. Sheri Miller, CWA of North Carolina Director and Mary Frances Mary Frances Forrester, CWA of North Carolina Associate Director spoke to over 75 women and men in attendance. Prayer/Action Leaders, Lorie Brothers and Sandy Brown. 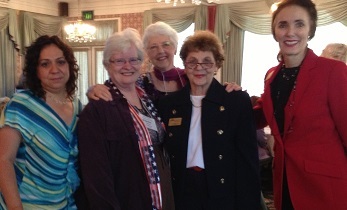 of the Henderson County Republican Women’s Club. Sheri Miller spoke on “The Battle for America’s Soul”, protecting the liberties and Judeo-Christian values upon which our nation was founded, and to restore the soul of our country with faith, prayer, and dependence on God. Mary Frances Forrester spoke on “The Bills We are Watching” about protecting traditional values with your voice and votes. The audience was encouraged to take action by contacting North Carolina legislators in support of traditional family values bills. Tuesday, June 4 – Sheri Miller, CWA of North Carolina Director, was interviewed by South Carolina talk radio host, Tony Bean, on the “Christian Worldview Today.” The topic was Sharia Law and the American Laws for American Courts event scheduled for June 5 in Raleigh. Monday, June 3, 2013. Sheri Miller, CWA of North Carolina State Director, and Mary Frances Forrester, CWA of North Carolina Associate Director, discussed “The Battle for America’s Soul” and “The Bills We are Watching” with Dr. Bill Campbell, Talk Radio Host of WHKP 1450 The Vital Connection. Click here then scroll down and click on “Battle for America’s Soul” to listen. November 4, 2013 – State Director, Sheri Miller was interviewed by Tony Beane, radio talk show host of Christian Worldview Today. November 6, 2012 Listen to Election Night interview with CWA She Votes 2012 Leaders: CWA Executive Director, Kenda Bartlett and CWA of North Carolina Director, Sheri Miller. He Reigns! North Carolina Goes Red! October 9, 2012 WGCR Talk Radio Host, Shanna Lanning spoke with CWA of North Carolina State Director, Sheri Miller concerning the November Elections and She Votes 2012, CWA’s national project to get out the vote. Sheri Miller stated, “According to research, only half of the Christians in our country are registered to vote, and of those only half actually vote.” Listen now! The Battle (Page 1 of the CWA of North Carolina October/November 2912 News Report.